Heat oven to 400°F. Spray 6 (10-oz) ramekins or custard cups with cooking spray; place on 15x10x1-inch pan. In medium bowl, stir Bisquick mix, 1/2 cup of the cheese, water and egg until soft dough forms. Set aside. In 3-quart saucepan, heat chicken, salsa, beans, corn and cumin to boiling. Remove from heat; fold in avocado. Divide chicken mixture evenly among ramekins. Spoon dollop of Bisquick mixture over each (dough will not cover entire top). Bake 15 to 20 minutes or until crust is golden brown and filling is bubbly. Sprinkle with remaining 1/4 cup cheese. Serve with sour cream and lime wedges. Do you have frozen corn on hand? It will work just as well as the canned corn. Just thaw 1 1/4 cups corn and drain before using. 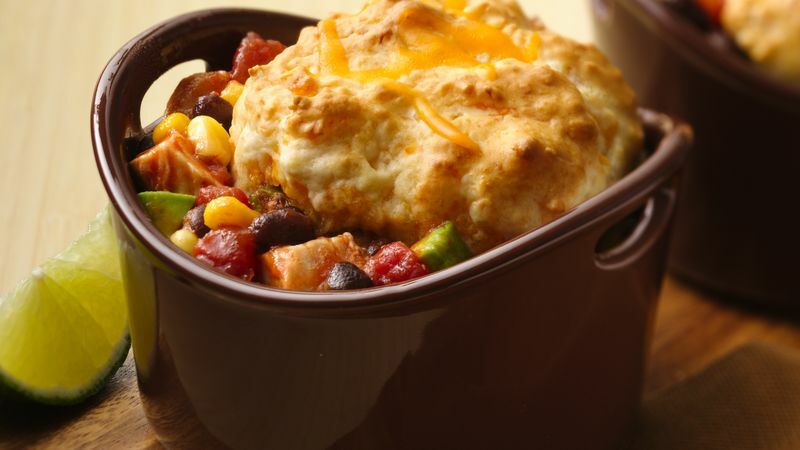 These individual pot pies are the perfect way to help control portions. Ramekins are also ideal for making individual desserts.